Here it is, the protagonist of awakening and after lunch to millions of Italians: the unfailing coffee maker "Moka" that now also in many homes in Naples has replaced the old Neapolitan coffee maker. to forget only one can nullify all the work undertaken. First you have to choose a quality blend. This should be kept in a tightly closed container and away from foods that emit strong odors (herbal teas, cheeses, ...) because the coffee has the ability to absorb odors, which would alter the aroma. The water is the second factor that determines the success of a good coffee espresso (it is said that in Naples the water is the secret of his tazzulella): Use fresh water and possibly poor limestone. Never use hot water to speed up the preparation. Fill the boiler up to the level of the safety valve, without exceeding it, otherwise you will have a coffee. The long coffee is a type of coffee totally different from the espresso ones. Fill the filter generously, without pressing the coffee powder, forming a small bump (someone, however, has a habit of pressing the mixture slightly and then make three holes with a match). Close the coffee maker tightly and place it on a slow fire, this is very important. As soon as the coffee starts to come out, immediately lift the lid to prevent condensation of the steam falls into the pot. Before the coffee is completely released, remove the pot from the fire (in practice, a few seconds before escaping steam left in the boiler. Do not worry if remains a little water in the boiler, because everything that comes out in the final stage can only ruin coffee). Never leave boiling coffee on the fire: this would burn him, jeopardizing the success. Enjoy hot coffee, fresh out! In use, the inner walls of the boiler, the jug and the filter will pick up a thin layer of fat residues of coffee. This coating protects the coffee from contact with the walls of aluminum, which might otherwise give it a metallic taste. For this reason it is always advised to wash the coffee pot with water only, never use soaps and detergents, or worse, the dishwasher. Remove the limestone with a warm solution of water and vinegar. 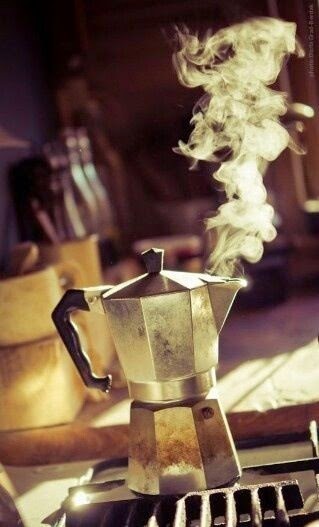 After you place the moka on fire, is formed in the boiler of the steam that remains in equilibrium with the water below atmospheric pressure. Increasing the temperature increases, the water vapor pressure: this pressure compresses both the walls of the boiler, but also the surface of the water. When the pressure reaches the value of 1.5 atmospheres, the pressure on the water is sufficient to overcome the force of gravity and so the water begins to rise along the only path available, that is, the tube of the filter. When all the water has risen in the boiler is only water vapor, which fuoriusce last for creating the typical final gurgle. Caffè Torre for a perfect Neapolitan Espresso. Kit with pods (5 different blends), sugar, cups and spoons. Machines on free loan by purchasing kits. Here are avail Caffe espresso ,Caffe in cialde ,coffee pads, coffee pods and Coffee. Hey. How would most Italians add water or milk at home? Thanks you for your article.